Indians can no longer be proud as a peacock. The national bird is being pushed to the brink of extinction. Poaching, indiscriminate use of pesticides and lax laws to nab those who kill the peacocks for their feathers, all add up to an endangered peacock population, writes Aditi Tandon. THE national bird of India is struggling for survival. The peacock population is dwindling fast due to habitat loss, contamination of food sources and poaching. Ironically, until today no census has been conducted of the peacock. Non-feasibility has been cited as the only reason. The sole stock-taking of the peacock population in India was done by WWF India in 1991. It revealed that India was left with only 50 per cent of the total peacock population that existed at the time of Partition in 1947. While the green peacock is already believed to be extinct, the peacock may soon end up on the critically endangered list. According to the Earth Island Journal, a journal that focuses on the environment and wildlife,"Farmers use pesticides to battle termites. After munching seeds treated with these insecticides, male peacocks have been seen falling from trees, unable to fly." 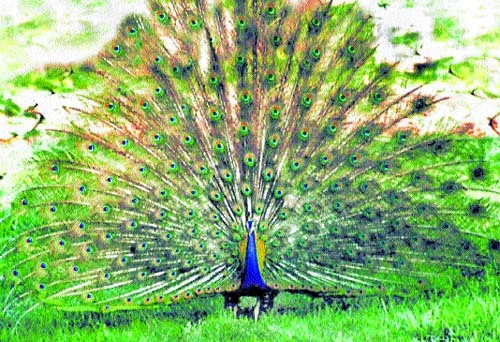 In great demand for their feathers and flesh, peacocks are being mercilessly hunted down all over from Rajasthan and peripheral Delhi to Haryana and adjoining Punjab, once a rich peacock belt. Peacocks are also targeted for their fat which, some mistake as a cure for arthritis. Poaching is the most vital cause of the plummeting peacock population across India , followed by environmental contamination caused by sprinkling of heavy pesticides and insecticides in the fields. The most recent case of poaching surfaced in a Hoshiarpur forest in Punjab on February 29 when two honorary wildlife wardens Gunraj Singh and Sukhdeep Singh Bajwa caught SDM Pathankot with the "kill". To the utter amazement of wildlife enthusiasts, the SDM managed bail in an otherwise non-bailable offence, punishable with three years imprisonment and Rs 10,000 fine. Further investigations conducted by the Wildlife Institute, Dehra Dun which said the bird died due to gunshot wounds, stood in sharp contrast to reports of the local Hoshiarpur Veterinary Hospital, which said the birds died due to suffocation. The report added that a detailed examination was not possible because the birds were rotten. While the case is lingering, with the honorary wildlife wardens under tremendous pressure to compromise, it is to be seen if a conviction in an offence against the national bird comes through, especially when the over-all conviction rate under the Wildlife Protection Act is abysmally low. In Punjab alone, only two poaching cases (one in Ludhiana and the other in Ropar) reached the court in the past three years. Wildlife Department officials confirm that in both the cases the alleged culprits were let off after being sent to a 14-day judicial remand, despite the fact that the peacock is protected under Section 51, 1-A of the Wildlife Protection Act and its killing is strictly prohibited. Of the few prosecutions in the peacock killing cases in India, a landmark case, pursued till the prosecution stage in India involved Lt Gen Baljit Singh (retd), the then Chief of Staff Central Command at McCluskieganj near Ranchi, Bihar. Following the killing of two peacocks in his area of command, Lt Gen Baljit Singh launched a campaign to redeem the honour of the national bird. It was in this case that the first-ever prosecution of the two suspected culprits happened. Ever since, the rate of prosecution has been dipping, while conviction is unheard of in cases registered under the Wildlife Protection Act. With rates of conviction so low, fowlers and poachers find it easy to stalk the birds and kill them for feathers. K.M. Thakur, Regional Deputy Director, Wildlife Preservation, Northern Range, New Delhi, when contacted, said though export, import and internal trade of peacock had been banned under the Wildlife Protection Act. "Only shed feathers are allowed to be used for the small scale industry. But poaching of the peacock is rampant in Punjab, Haryana and around Delhi. It is difficult to determine how many peacocks have been lost over the years because a census of the bird has not been done till date. It is not feasible. As of today, the peacock-rich belts are Haryana, adjoining Punjab, Rajasthan, Delhi, Gujarat and Uttar Pradesh." Admitting to large-scale poaching, Delhi-based Brig Ranjit Talwar from WWF India, reasoned, "Poaching of peacock is done for white meat. While the young ones are mainly trapped for eating, male peacocks are killed for feathers. Actually, the law permits collection of moulted feathers, but once the feathers have been used in artifacts it is difficult to say whether they were shed or pulled out. Another problem in detecting violators is that most peacocks are killed outside the protected areas. That is why 99 per cent poaching cases go unreported." A cause for concern is that most of the peacocks, according to wildlife experts, are killed during the mating season. 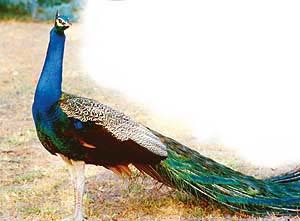 A Punjab Wildlife Department official says, "It is the easiest to kill a male peacock during the mating season when it dances around in the open and can be easily targeted. You can well imagine how threatened the peacock species would be when the male birds are being killed just before mating. It is also easier to hunt peacocks down because they sleep in the same trees every night. The procedure of killing is simple. First the head is cut off, then the crest is ripped off and then the tail feathers. There are fowlers who are even more cruel. If they don’t want the feathers to be smeared with blood, they first trap the bird, break its legs, pull out feathers and then kill it." Peacock deaths have also been reported due to deliberate spraying of pesticides in fields. Haryana and Punjab are peculiar examples in this case. Punjab that once had a heavy peacock concentration in Nabha-Patiala-Sangrur-Jalandhar belt now has few birds left. Haryana’s case is the same. When mortality in peacocks was reported in village Rampura in Mahendragarh on December 2, 1999, a detailed examination was carried out by experts from Chaudhary Charan Singh Hisar Agricultural University (CCHAU) in Haryana. A team consisting of veterinary toxicologists, pathologists and external specialist were rushed to the spot to carry out investigations. The team reached in time to find one newly dead and one sick bird. The experts concluded that the peacocks died of chlorpyriphos toxicity. The mortality was among male peacocks only, which were seen picking up wheat grains from the recently sown fields. The concentration of Chlorpyriphos in the dead peacocks was found to be (0.7575 ppm), three times higher than prescribed. This level of concentration could not have been possible if the seeds were treated as per the package of practices of the university. Referring to the CCHAU study, R.D. Jakati, Chief Wildlife Warden, Haryana says the peacocks are killed less due to poaching and more due to environmental contamination. "Farmers treat seeds with pesticide doses three times higher than recommended. The HAU study revealed high concentration of pesticide chlorpyriphos in the peacocks that died in Mahendragarh some time back. There are intermittent reports on peacock mortality due to consumption of seeds treated with pesticide 24 D, a weedicide." To contain this dangerous trend, Haryana has launched awareness generation programmes in villages. "District-level inspectors visit three villages every month. They educate farmers on the need of using the right quantity of pesticides. But farmers have problems of low yield." Haryana wildlife officials have also written to the Agriculture Department to work out options of animal and bird friendly pesticides. THE male peacock (zoological name Pavo Cristatus) is a colourful, swan-sized bird, with a fan-shaped crest of feathers, a white patch under the eye and a long, slender neck. The male of the species is more colourful than the female, with a glistening blue breast and neck and a spectacular bronze-green train of around 200 elongated feathers. The female is brownish, slightly smaller than the male, and lacks the train. The elaborate courtship dance of the male, fanning out the tail and preening its feathers, is a gorgeous sight. The peacock is widely found in the Indian subcontinent—to the south and east of the Indus river, in Jammu and Kashmir, east Assam, south Mizoram and other places. Peacocks are related to pheasants. Though also domesticated in villages, they are found mostly in jungles close to a waterfront. In Indian mythology, the peacock is the vehicle of Lord Karthikeyan. IN the 1980s, the USA woke up with a start to find that the bald-headed eagle, its emblem bird, had stopped hatching and multiplying. Its egg shells had become fragile and were cracking up in incubation. Many chemicals were also detected in the sources of its food. Because it was a national bird, a country-wide awareness campaign was launched through talk shows on TV and articles in newspapers. For a year, mass media devoted major space to stories on the national bird and strategies for its revival. A multidisciplinary approach was adopted to arrest the fall in the bird’s population. Pesticides were banned, drives were launched to bring the bird back into the procreation cycle, it was put on the endangered list and highest penalties were fixed for harming it. Researchers’ sole job was to single out every breeding pair, mark its nest under surveillance and protect it from predators. Once the eggs hatched, supply of unadulterated food was ensured. The Americans even acted as foster parents to the birds, teaching the fledglings to fly. The USA harnessed all its modern technology to ensure that by the turn of the century the bird had staged a comeback. Last year, the population of the eagle stabilised and it was removed from the endangered bird list. But that was the story of a national bird in a country that cared for it. THE peacock is protected under Schedule I of the Wildlife Protection Act, 1972. Section 9 of the Act prohibits hunting of wild animals and birds specified in Schedule I, II, and III and IV, except as provided under Sections XI and XII. This classification has been made keeping in mind the significance and population of wildlife. Those highly threatened find a place in Schedule I. Section 51 of the Act prescribes a maximum imprisonment of six years, Rs 25,000 fine or both for hunting animals and birds specified on Schedule I. In case of partridges (also killed in the recent case in Hoshiarpur, Punjab), mentioned in Schedule II, Section 51 provides for a maximum imprisonment of three years, Rs 25,000 fine or both. In case of Haryana, where the partridge is a state bird, its hunting is a non-bailable offence. Even though the punitive measures under law are exhaustive, the enforcement is very poor. Wildlife Department officials admit that out of 100 killings of a peacock, just one is reported. Although a case is sometimes registered under the Wildlife Protection Act, it never reaches court because of several inducements for key witnesses of poaching. Even if the case reaches court, the lack of awareness about Wildlife Act provisions invariably results in miscarriage of justice. That is why one hardly hears of convictions under the Wildlife Protection Act. India set a precedent by formulating The Wild Birds Protection Act of 1887, the first law for the protection of wildlife wealth. Later, India had the Wild Bird and Animals Protection Act in 1912, prohibiting capture, killing, selling, buying or possession of specified animals or birds. With future amendments, wildlife sanctuaries were set up to promote wildlife conservation. The Wildlife Protection Act, 1972, became a watershed because it addressed various aspects of the issue. In 1986, trade or commerce in trophies and animal articles was prohibited. The 1991, an amendment made punishments more stringent. It also banned trade in imported ivory and products and transportation of wildlife or products without permission.